Rachael Leahcar smashed Australian television records with her Blind Audition on the first season of The Voice (2012). With a career that has seen her release four top 10 ARIA charting albums, tour a live show about her life to sold out crowds and travel to Italy to sing with Andrea Bocelli’s orchestra, Rachael has shown that she is capable of achieving anything despite being legally blind. Rachael’s latest album, Shadows, debuted at #5 on the Australian Album ARIA Chart and won her a South Australian Music Award following a national tour in November 2017. Rachael has the charming ability to hold an audience in the palm of her hand with haunting moments one minute and singing and dancing the next. The release of “Ave Maria” duet with fellow The Voice and legally blind artist, Lara Nakhle, is sure to melt hearts of those young and old. 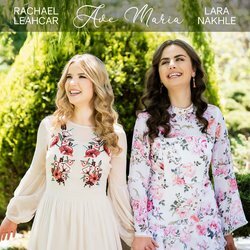 Commonly described as “angelic”, Lara’s dynamic range complements Rachael’s caressing of the notes to create a truly unique and beautiful piece of music.